Size of this preview: 600 × 600 picteilín. Other resolutions: 240 × 240 picteilín | 480 × 480 picteilín | 1,000 × 1,000 picteilín. Seo comhad as An Cómhaoin Viciméid. Tá an tuairisc as an leathanach tuairisc Cómhaoin a leanas thíos. Is stór comhaid meáin Saor é an Cómhaoin Viciméid. Is féidir leat cabhrú. The five cardinal gems of antiquity. 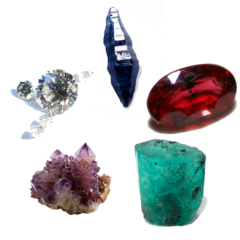 Clockwise from top: Sapphire, Ruby, Emerald, Amethyst, Diamond. Alternative names Robert Matthew Lavinsky; Lavinsky, Robert M.
sannadh – Ní mor creidiúint a thabhairt leis an saothar, faoi mar a shonraigh an údar nó tabharthóir an ceadúnais (ach ná húsáid modh a thugann le fios go thacaíonn sé/sí tú féin nó an úsáid a bhaineann tú as an saothar). comhroinn araon – Má athraíonn tú nó síneann tú amach an saothar seo, ní féidir é a dháileadh ach amhaín faoin gceadúnas céanna nó ceann cosúil leis an gceann seo. Cliceáil ar dáta/am chun an comhad a radharc mar a bhí sé ag an am sin.